Val d’Orcia is definitely one of the most beautiful places in the world, and I really love to live here. But sometimes I need something different: people, shops, theaters, cinemas… in one word: city life! That’s why usually once a month I go to Florence, the nearest and bigger town, about 80 kilometers away from my beautiful hills. Last weekend I really enjoyed the exhibition “Artigianato e Palazzo” (www.artigianatoepalazzo.it): every year, since 1995, Princess Giorgiana Corsini with Neri Torrigiani organize this amazing event in the beautiful Italian-style Corsini Gardens (one of the most famous in Florence). They select many artisans who are the focal point of the event, most of them from Tuscany, but also many other areas of Italy. I really love to walk in the Giardino Corsini, discovering how artisans create their objects by hand, and watching them work in the small workshops erected in the garden and orangeries. Here’s a selection of my favorites this year. Castello di Potentino (www.potentino.com) has recently launched a design line, collaborating with some famous designers, to develop a 21st Century Castle brand. Nigel Coates, Jono Nussbaum, Clare Frost and Gerry De Bastiano created forniture, textile and ceramics: the design has been influenced by wide array of aesthetic histories - Etruscan, Medieval, Oriental, Renaissance, ‘50s, ‘60s and ‘70s - but also by the interiors, the spaces, the dogs (!) and the surroundings of Castello di Potentino. I really love the Etrusco Ceramics Luxury Limited Edition, in white and platinum: so elegant and refined! Eva Munarin (www.evamunarin.it) has an atelier in Colle Val d’Elsa, near Siena, and her objects are just amazing! She creates her hand-decorated ceramics with an artisan procedure that utilizes various styles such as the historic “Majolica” technique, which results in characteristic lines and dots indicative to the firing process. I really love the colors, the texture and the style of this beautiful vases! 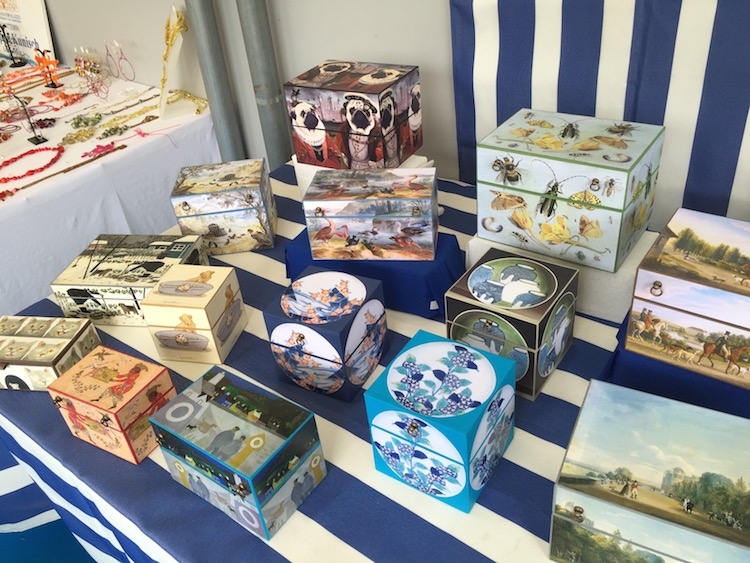 I really appreciated the handmade boxes created by Ann Hepper: she uses linen, hemp, hand-painted papers, antique postcards, prints, photographs, and many other materials. Her creations are perfect to keep secrets, stamps, CDs, jewelry, love letters… or just as a decoration on a desk! Arianna Leoni (www.leoniarte.wix.com/leoniarte) is another passionate and creative woman who creates really original objects in ceramics: she’s from Sardinia, and her creations are inspired by the Sardinian countryside, but also by the elements of the marine world. All lamps, vases, bowls, shaped as coloured spiky sea urchins, dreamy jellyfish and beautiful corals, are crafted with great technical skill and amazing expressive power.